I have one more school day and then spring break will begin. However..the weather hasn’t received the memo but I can’t complain. We do not have snow. Frost, yes. I can deal with frost. My big plans for the break include 2 things: A brief camping trip with Stephen’s family and a week-long home project. I’m finally getting my own office space. The “throw random crap in here because I can” room is now going to be the girl cave. I need to get busy picking out colors. I’m leaning towards beachy water colors with navy. I have always loved navy but never wanted to paint a dark room. I’m going with a softer pastel to go with the rest of the house (good resell point) but accenting with navy. These next few days, I will be away from the computer and I’m going to take a brief break from posting. I will continue to post a Whole 30 update because I’m not the only one working through one and right now, that is my most searched content. I hope to get some fantastic recipes posted soon, too. Hope…key word here. Now, on to the details. How am I feeling other than ready to get this last day (tomorrow) over with? EXHAUSTED. Mentally and physically. This time tomorrow, I’ll be asleep by a fire pit or asleep in a motor coach/tent. I’m not picky right now. I need serious sleep. Breakfast: Another bowl of Sunrise Scramble. Sausage, eggs, sweet potatoes. It was good, but I didn’t eat enough. I was hungry around 9:30. Lunch: Soup and an apple. I felt like I could have eaten a dinosaur. Rare. With bacon. My soup was a frozen concoction of chicken and veggies like onions, carrots, kale, zucchini, and cilantro. I squeezed some lemon after warming it up. Snack: Long afternoon meeting and they had a fruit/veggie tray. I made myself at home. I didn’t miss the yogurt or ranch dip at all. I wanted the cold crunchy food. Dinner: Fat, glorious fat. 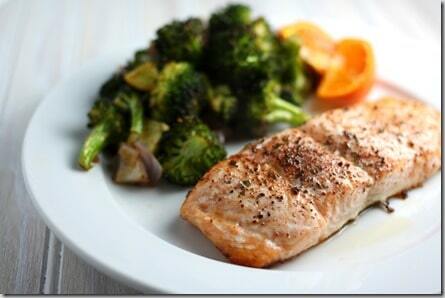 Omegas in Salmon with roasted broccoli. 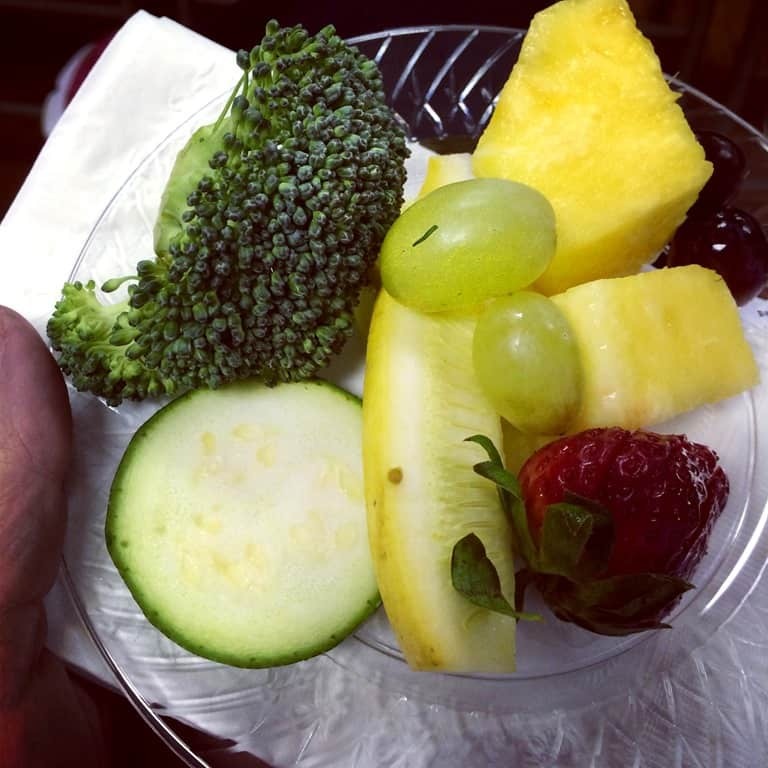 Thoughts: I’m not eating enough at breakfast. I posted this picture on instagram this morning. 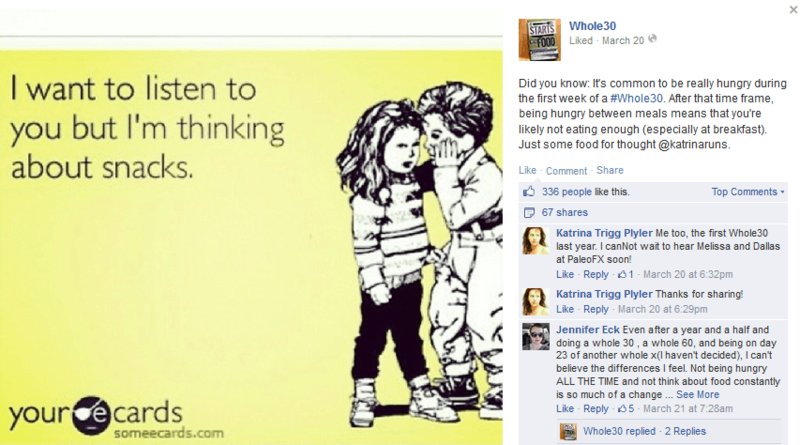 And someone from Whole 30 picked it up and posted it for discussion on the fb page. I was a tad star-struck. Not gonna lie. Time to get spring break started!